The Living Water Project consists of a group of creations, actions and reflections about the water element from an artistic-scientific experimental perspective. From the study and experimentation of the water element through the performance, based on my artistic practice, I work through the dance, the sound landscape, the music, the artistic installation and the urban intervention in an interdisciplinary project, carrying the message of water to different contexts, from public to private spaces, from daily to artistic spaces, relating them through actions that go from one to the other, tracing a connection in between. The genesis of the Água Viva Project (The Project Água Viva) goes back to November 2013 when I participated in a workshop of projects around the element of water at the Faculty of Fine Arts in the Universidad Complutense of Madrid, in which I was doing the Research in Art and Creation Master, a project that I have continued by undertaking the PhD in Fine Arts. The workshop concluded with an art exhibit, in which I participated with the performance “Água Viva”, in the same university, with projects led by Esther Moñivas, an art historian focused on the hydric presence in contemporary art. The frame of the H2O Emergenicas exhibit, led by Esther Moñivas Mayor, at La Trasera de la Facultad de Bellas Artes UCM, in November 2013, represented the XIII Semana de la Ciencia y la Celebración del Año Internacional de la Cooperación en la Esfera del Agua 2013. This same exhibit took place at the virtual platform Water Bodies. From this, I am developing different ways of working with the element of ‘Water’. 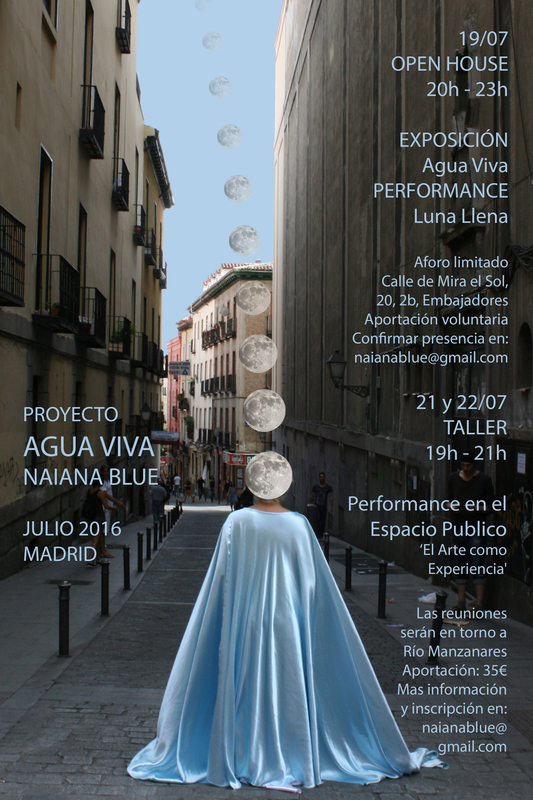 In July 2016 the project held an Open House with Living Water Exhibition and Performance Full Moon, plus a Workshop Performance in Public Space.